I-87018RW | 8-channel Thermocouple Input Module High Over Voltage Protection. Supports +/- 15mV, +/- 50mV, +/- 100mV +/- 500mV, +/- 1V, +/- 2.5V, and -20mA ~ +20mA input types. 8-channel Thermocouple Input Module High Over Voltage Protection. Supports +/- 15mV, +/- 50mV, +/- 100mV +/- 500mV, +/- 1V, +/- 2.5V, and -20mA ~ +20mA input types. 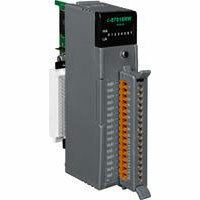 I-87018RW is a Thermocouple Input Module with 8 differential input channels. It requires Optional External 125 Ohm Resistor and the input types it supports are: +/- 15mV, +/- 50mV, +/- 100mV +/- 500mV, +/- 1V, +/- 2.5V, and -20mA ~ +20mA. The thermocouple types it supports are: J, K, T, E. R. S, B, N, C, L, M, and LDIN43710.